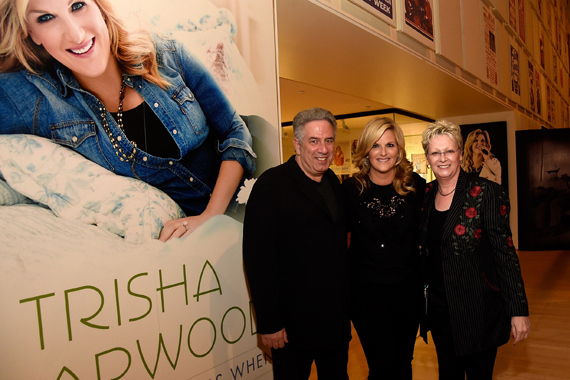 Pictured (L-R): Vector Management’s Ken Levitan, Trisha Yearwood, and Carolyn Tate, Senior Vice President of Museum Services at the Country Music Hall of Fame and Museum. Photo: Rick Diamond/Getty Images for the Country Music Hall of Fame and Museum. You might have met her when she was a Belmont student. Or you might have met her when she was a tour guide at the Country Music Hall of Fame. You might have met her when she was the receptionist at MTM Records. Or you might have met her when she was singing demos for the songwriters and publishers on Music Row. You might have met her when she was singing with Pat Alger & The Algerians at Douglas Corner Café. Or you might have met her when she was a hopeful newcomer at MCA Records. She tells me that I met her on at least three of those occasions. I don’t remember. “Was I nice?” I asked. “Oh, yes, always,” she assures me. Thank goodness for that. What I do remember is that the first time I heard her on MCA, I called her “Goddess.” To her face. And that is what I have called her ever since. And Goddess she was, at the opening of her new exhibit at the Country Music Hall of Fame & Museum. 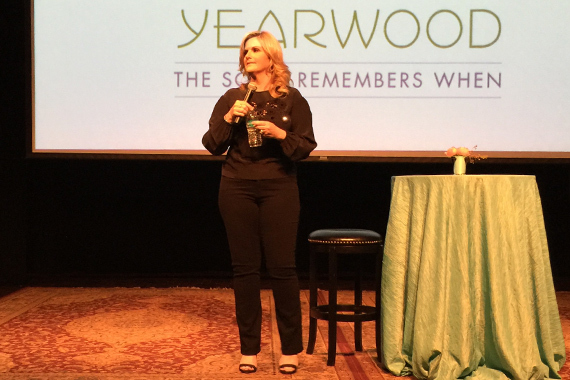 “You were invited because you are my friends and my family,” Trisha Yearwood told the attendees at the opening party on Tuesday evening (6/30). “You supported me from the beginning. “Those of you who’ve known me for a long time know that I am not a cryer. But I am so emotional, so bear with me. I am so honored. From having been a tour guide here, I have such respect for the people who work here. She singled out “the first Garth,” producer Garth Fundis, as well as “the second Garth,” husband Garth Brooks, with whom she is now on a record-shattering national concert tour. Both were in the party crowd. Tate added that Yearwood is now a multi-media phenom with her own cookbooks, TV cooking show, kitchenware line, acting credits and, now, her own namesake “Shero” Barbie Doll. OMG: I must have one. “Enjoy the exhibit,” said Goddess. We did. It includes mementos from her “Georgia Peach” childhood, including tragic early promo photos and a 45 r.p.m. record funded by her dad. She collected Elvis records as a kid and got an autograph, both of which are illustrated. She came to Nashville in 1995 to attend Belmont. This is documented, as well. Awards, sheet music and costumes are displayed, including outfits from her roles on JAG and Dr. Quinn Medicine Woman. 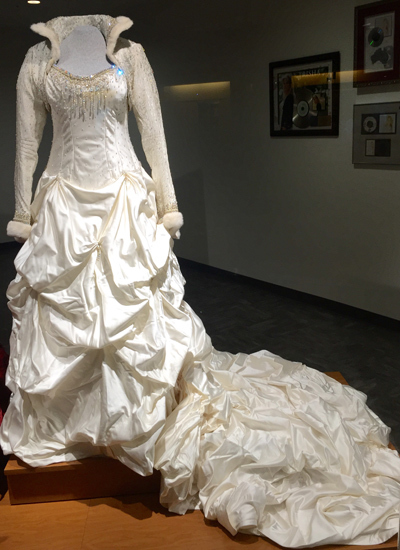 Gorgeous gowns, including her fabulous wedding dress, are on display. The exhibit concludes with stuff relating to her new status as a Southern-cuisine diva. Her Emmy-winning cooking TV show is a spin off from her displayed cookbooks and has spawned the also displayed kitchenware, cookware and the like. Jen Falco, Eric Parker, Allie Brooks and members of Yearwood’s inner circle comprised the younger element of the attending multitude. Regular column fabulons working the room included Chuck Dauphin, Charlie Monk, Chris Horsnell, Bruce Hinton, Scott Borchetta, Bob Paxman, Maurice Miner, Mark Miller, Dave Pomeroy, Donna Hughes and Deborah Evans-Price. Yearwood’s own Grammys were admired by Steve Buchanan, Earle Simmons, Jeff Walker, Jane Braddock, Ken Levitan, the Frist Foundation’s Peter Bird, Harold Bradley, Tom Roland, real-estate maven Phil Ryan, Lisa Harless, Rusty Jones, Peter Cooper and Dave Pomeroy, among a throng of others.